Hobart Brown and I left Ferndale at 8:30 a.m. and arrived in Baltimore after dark, a coast to coast trip of about 2700 miles. 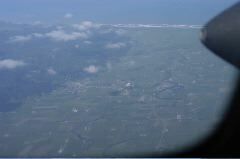 On the left, Ferndale as we flew over the Eel River Valley. On the right, a pair of signs that really show how different the east coast is from Ferndale. 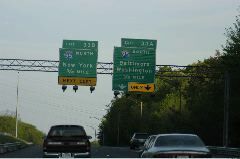 The signs read "New York" and "Baltimore Washington" with distances to the exits. You could drive through three to five states in a couple of hours here; every exit sign evokes U.S. history. 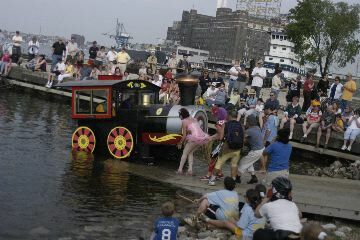 True Kinetic Craziness Abounds in Baltimore! 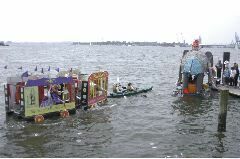 Rebecca Hoffberger, founder of the U.S. East Coast Kinetic Sculpture Championship Race and director of the American Visionary Art Museum (AVAM) in Baltimore, Maryland and Hobart Brown, Glorious Founder of the Grand Championship Arcata to Ferndale Kinetic Sculpture Race in Humboldt County, California. I was privileged to accompany Hobart Brown from California to Maryland as his personal assistant. We were splendidly hosted by AVAM and Ms. Lane Berk, Kinetic Seer during our eastern visit. 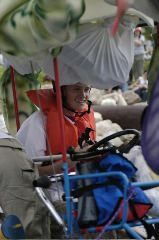 I hope you enjoy reading about the 2004 Baltimore Kinetic Sculpture Race as much as I enjoyed attending it. The folks who cover Baltimore year after year have a crew of four. They have pictures of every 2004 machine. 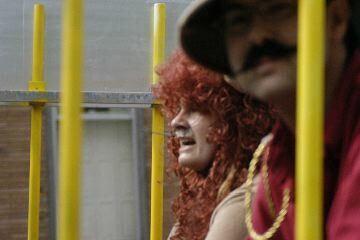 The Ringmaster and the Amazing Madame Lolly from Cirque du Sore Legs, an engine and two car sculpture of a circus train with six pedalers and a pit crew of about a dozen. Their design, energy, breakdowns and kinetic joy were so apparent to all that they won the People's Choice Award and the Spirit of the Glorious Founder Award. 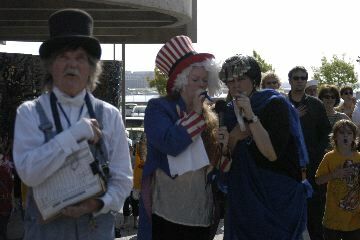 Glorious Founder Hobart Brown before the opening ceremonies. 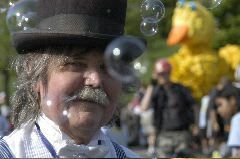 The bubbles were produced by an ingenious portable machine provided by "The Bubble Guy" Felix Cartagena of Newark, Delaware. 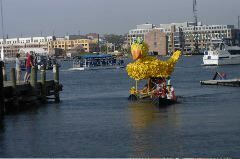 The Duck, racing for the Catholic Community School of Baltimore is in the background. 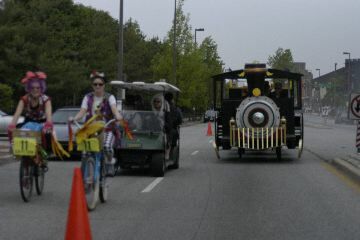 Brake and safety checks continued along Battery Avenue until the opening ceremonies. 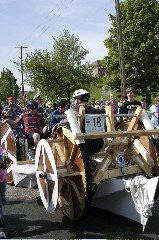 Unique wooden propulsion system on the Valking Viscar Boot worked for a little while, pilots ended up turning the wheels by hand and took a tow on city streets until they trucked their sculpture to the first water loop. 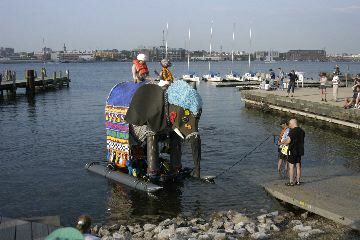 The sculpture was built by the Valley Academy and the Jemicy School of Towson, Maryland and was awarded Worst Honorable Mention. 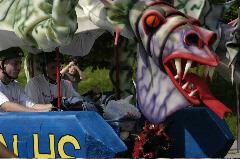 The Two-Headed Dragon was built by students at Southern High School which recently underwent a restructuring that separated the school into arts and academics. 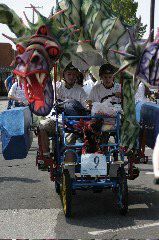 The two heads on the Two-Headed Dragon represent how the students feel about the schism in their school restructuring. They won Best Pit Crew and the Sock Creature of the Universe Award for a miniature version of their magnificent foam and airbrush artwork. Kinetic Volunteers kept racers on course. 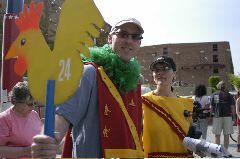 Each was outfitted with a unique vest and a numbered chicken sign which matched points along the route. After climbing Federal Hill Park, the Duck passes a huge flag which commemorates the unsuccessful 25-hour siege of Baltimore in 1814 which inspired Francis Scott Key to write what became the United States National Anthem in 1951. 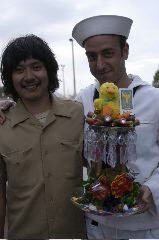 The Duck was built by students of the Catholic Community School of Baltimore easily identifiable by their baby blue and bright yellow tee-shirts and enthusiastic attitudes. 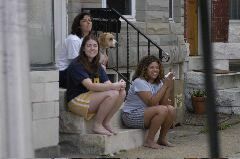 Diverse Baltimore residents watched from the famous marble steps of Baltimore row houses. Dave Silver, of Discovery Channel's Monster Nation, films the judges and Glorious Founder from one of the AVAM golf carts. 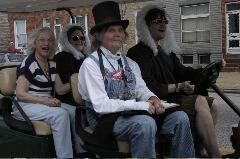 Judges and Glorious Founder chasing the sculptures in an AVAM golf cart. 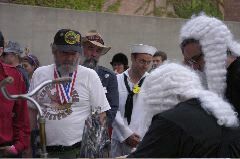 L-R: Lane Berk, Kinetic Seer; Judge Kim, Hobart Brown and Chief Judge Ed Istwan. 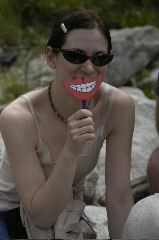 Independent filmmaker Lisa Lewenz displays a giant kinetic smile. 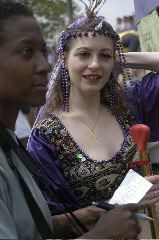 It remained pasted to her face until we parted two days later. 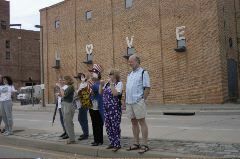 Rebecca Hoffberger and distinguished guests wave at passing sculptures in front of the AVAM Kinetic Annex. 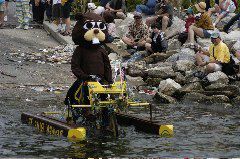 Kinetic Airways enters the water at the Canton Water Loop piloted by Bob Buerger of Crystal Lake, Illinois. 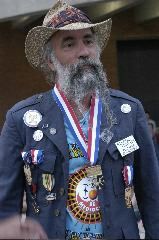 He was only one of two pilots to Ace in Baltimore in 2004. La Kafkaracha was built by the Franklin and Marshall College of Lancaster, Pennsylvania and represents the half-human, half-cockroach from Franz Kafka's Metamorphosis. The intent look on the pilots face is because they are steering directly for the rocks and a piling. Perhaps they realized the true meaning in Kafka's statement, "From a certain point onward there is no longer any turning back. That is the point that must be reached." 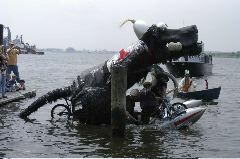 One of the pilots of the Two-Headed Dragon looking relaxed in the water. 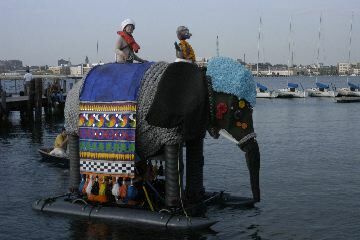 If sculptures strayed from the course, volunteers in boats and kayaks waited to pull them back. 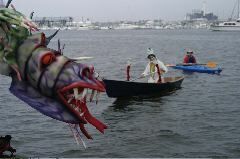 Here the Two-Headed Dragon passes a water wizard in a row boat in Baltimore Harbor. 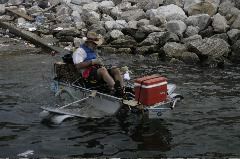 Jimbo Hanson of Woodstock, New York, takes his Beaver Bike II into the water at Canton Loop. 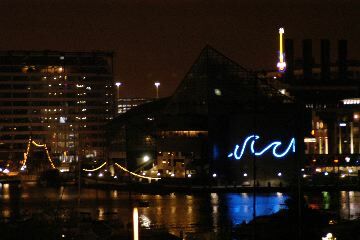 He was one of two racers to Ace in Baltimore 2004. 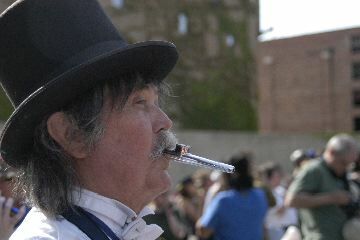 AVAM volunteers passed out smiles on popsicle sticks to spectators. 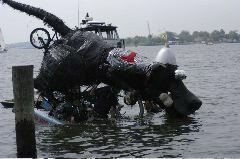 Louie the Dog by David and Eli Hess of Phoenix, Maryland won the Golden Flipper Award for this creative series of maneuvers where the pilots counterbalance the sculpture by walking and sitting and sliding on the pontoons. Louie the Dog rocking and rolling at Canton Water Loop. First one end goes down, then a pilot leaps to the other side, that side goes down but the other side goes up. The dance continued for only a few seconds, but seemed an eternity. 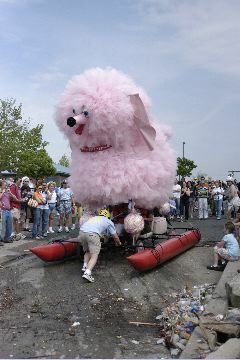 "Don't flip the Dog!," screamed a child, while spectators cheered for the intrepid crew as they continued to dance on their pontoons. The filmmakers were in agony because the pilots were wearing hundreds of dollars of microphones and other gadgetry Fortunately, Louie did not go completely over and the mikes survived. Then to the chants of the crowd, "I think I can, I think I can," Cirque du Sore Legs entered the water and was blown way off course. The Police boat decided they were too far away from the pier and effected a tow (one hour penalty). Under the stress of the tow, Cirque du Sore Legs broke in two. 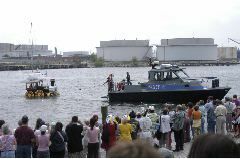 While the engine with the engineer and the ringmaster was happily chugging along after the police boat, the back end with twice as many cars and four people was towed back by two volunteers in a kayak! 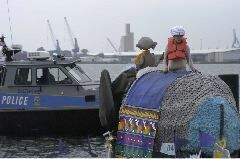 Bumpo, the police boat and the back part of Cirque du Sore Legs cluster around the dock. 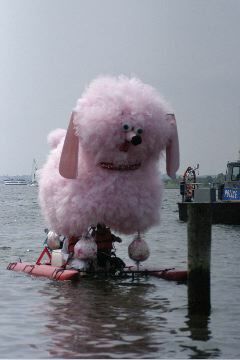 Even the misfortunes of their sculpture cannot dull the kinetic spirit of Cirque du Sore Legs pit crew and friend. 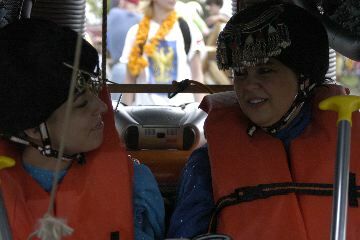 Left to right: Angela Conlan and Beverly Funkhauser. 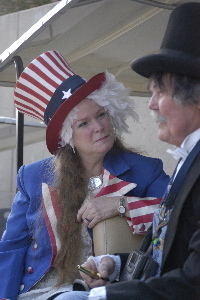 Here the Amazing Madame Lolly of Cirque du Sore Legs smiles as a competitor is interviewed by Associated Press. Notice even that the reporter who said she is more accustomed to covering death and destruction than "things like this" is wearing a Mona Lisa smile. 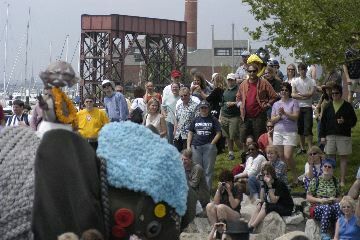 After the first water challenge at the Canton waterfront, the sculptures raced along Kenwood Avenue uphill to Patterson Park where a sand trap and a mud trap had been built by AVAM volunteers. Most sculptures did fine in the sand, but the mud was a real challenge. Lunch was available for spectators here; two men with a hot dog stand did a brisk business under a gazebo. Meanwhile, the slimy mud pit was surrounded by spectators waiting to see which sculptures would conquer the mud and which would be conquered by it. The Carver Coupe was built at the Carver Center for Arts and Technology of Towson, Maryland. It blasted straight through the mud which bogged down many other sculptures. 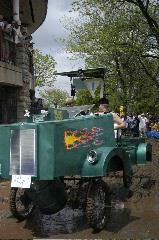 The machine is steered from the rear, with a steering bar behind the drivers. They carried and used portable welding gear to repair themselves outside the Museum of Industry. If you can zoom in on the picture, you can see two miniature Fifi dogs attached to their nameplate. 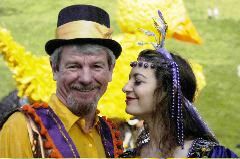 One suspects some long standing rivalry with the Fifi crew from AVAM. 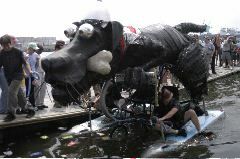 Flying even farther than Hobart Brown to get to the AVAM race, Theadora Brack of Paris, France, pushes her sculpture The Rat through the Patterson Park mudpit. Later, The Rat won the Next-to-Last Award. 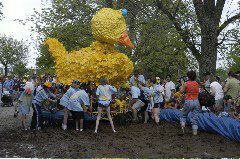 The Duck balks at the mud entry but was pushed through by its pit crew from the Catholic Community School of Baltimore several of whom took the opportunity to have a mud fight in the pit. 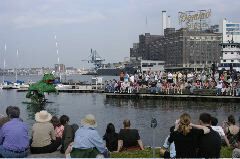 After all the sculptures left the mud pit, they raced through the streets of Baltimore, past the tourist section, past AVAM again and to the Baltimore Museum of Industry and into their second, and last, water hazard for the day. The Frog did beautifully at the Baltimore Museum of Industry water hazard. Its pilots, crew and friends wore shirts reading "Fear the Frog!" 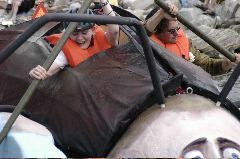 A member of The Duck's pit crew naps on the base of a David Hess sculpture at the Baltimore Museum of Industry while other teams wait their turn to enter the second water hazard of the day. The Duck floats beautifully in the late afternoon sun. Fifi pilots take away the best bribe award. 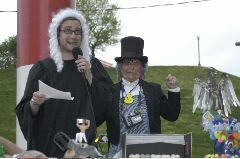 Chief Judge Ed Istwan and Hobart Brown announcing the Spirit of the Glorious Founder Award, earned with the People's Choice by Cirque du Sore Legs. Cirque du Sore Legs pilots and pit crew celebrate their Spirit of the Glorious Founder and People's Choice awards. Left to right: Pit crew - Frank's daughter Angela Conlan, Musical Bear - Peter Stern, crew - Karen Klemek, Engineer - Tom Bruni, Amazing Madame Lolly - Holly Tominac, Animal Tamer - Peter Constable, Strong Man - Michael Rios, Nice Little Old Lady aka Peter's Mom - Andree Maslen, Ringmaster - Frank Conlan, Glorious Founder Hobart Brown, and the Lion - Caroline Jacoby. 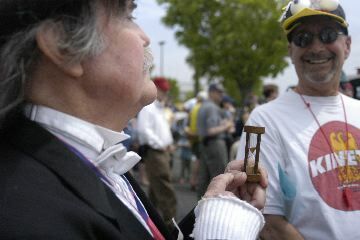 The pilot ofKinetic Airways Bob Buerger of Crystal Lake, Illinois has a solemn moment when his Ace Award was announced. 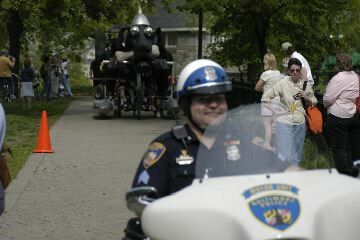 He was one of two pilots to Ace in Baltimore in 2004. Golden Dinosaur - Cirque du Sore Legs, Worst Honorable Mention - Valking Viscar Boot, Next to the Last Award - The Rat, Golden Flipper - Louis the Dog, Best Pit Crew - Two-Headed Dragon, Best Costume - CooKoos, People's Choice - Cirque du Sore Legs, Speed Award - Beaver Bike II, Engineering Award - Carver Coupe, Art Award - The CooKoos, The Grand East Coast National Mediocre Champion - Bumpo, Pilot's Choice Award - CooKoos, Best Bribes Award - Fifi, Sock Creature of the Universe Award - Two-Headed Dragon, Spirit of the Glorious Founder Award - Cirque du Sore Legs, and Ace Pilots Awards to Beaver Bike II, Kinetic Airways. 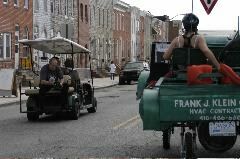 Thanks to all the racers, spectators, judges, volunteers, officials, unofficials, reporters, filmmakers, City of Baltimore employees and carriage horses who all combined to make this a very memorable week. 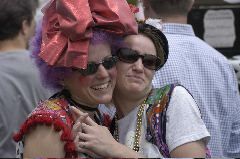 If you're out in Baltimore next spring, catch this race. It was a lot of fun. 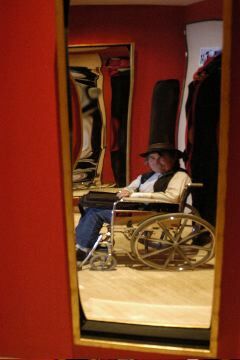 Hobart in mirror at AVAM. Cirque du Sore Legs at final water hazard. 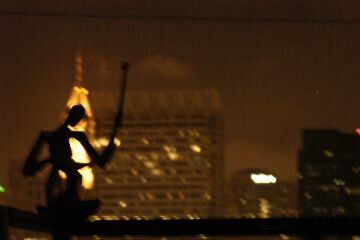 Statue on balcony of townhome with highrises in the background. What else is on my site?